Before you can view the disassembly and all other information associated with the disassembly, you must press the Disassemble button. a. Disassemble Button. Pressing the Disassemble button compiles the code and then disassembles it, extracting various aspects of the program and displaying the result as described below. b. Show Source w/ I2L. 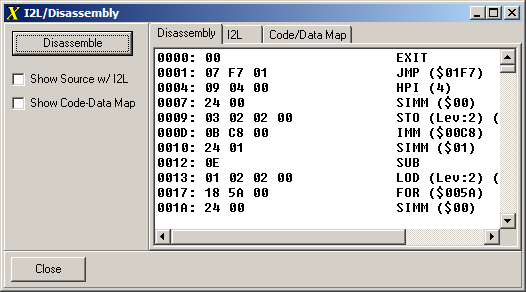 When this option is enabled, the source code for the program is inserted into the I2L disassembly so you can see which lines of code generate which instructions. There are examples shown below. d. Show Code-Data Map. When this option is enabled, a map showing the positions of the code and data is displayed. This option is explained in detail below.